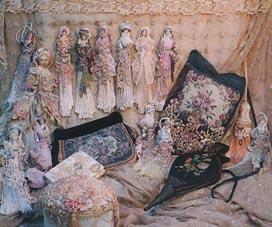 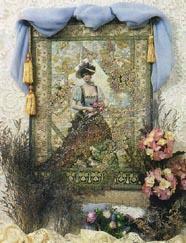 Butterfly Days wall hanging machine embroidered by Michelle Hill and embellished with lace and beads by Judith Coombe. 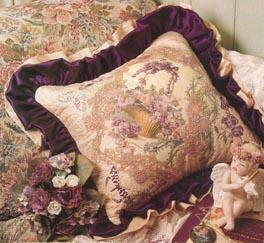 The machine embroidered Fantasy Cushion by Jenny Haskins uses a purple basket print and four hand-dyed lace motifs as its centrepiece. 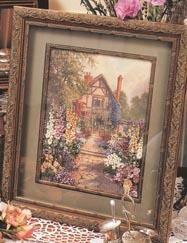 This delightful Hollyhock Cottage with a garden in full bloom was embroidered by Jane Ellis. 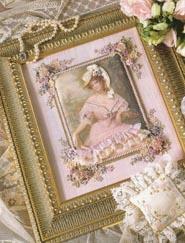 Lilac Lady, embroidered by Helen Eriksson is just one of the many new projects which will be included in Beautiful Embroidery with Judith & Kathryn. 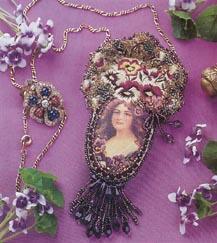 Judith Coombe has combined a silk print, machine embroidery and beading techniques to create this gorgeous Pansy Amulet. 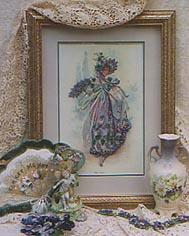 Krysha Kerin's beautiful Portrait of a Lady is available as a kit. 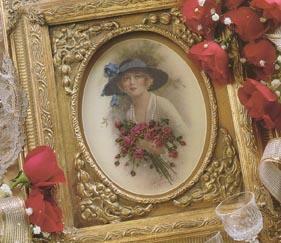 Red Roses for a Blue Lady one of Judith & Kathryn's most popular silk prints, has been enbroidered here by Helen Eriksson.